Prepare the filling methodPut the meat in the pan on the fire and add the oil, spices, pepper, cardamom, and leaves on the fire to boil the meat.Add the chopped onion to the meat in the pot after 10 minutes, and stir the mixture well, and simmer until the liquid is absorbed, and cook the meat well. Peel potatoes and wash well, then the pulp is removed from the center while retaining the pulp.It placed Letterman frying oil in a deep pot on the fire until heated, then fry the potatoes until golden color. Pulling potatoes from the oil and place in a colander or on the kitchen paper until Taatcefy of oil, and cool completely. Stuff the potatoes padding meat, and in the meantime, are the core of frying potatoes to the point where the equator. Put a quarter cup of oil in a tray, in addition to the core of deep-fried potatoes, and stacked inside potatoes stuffed with meat. Add half a cup of water and salt to taste. 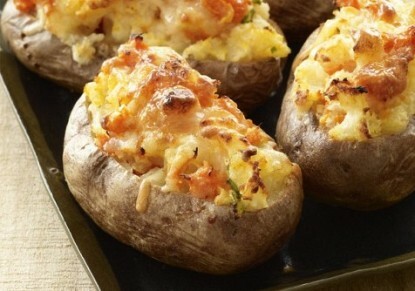 Sprinkle the cheese over the potatoes in China, then China's intervention in the oven on medium heat for a quarter of an hour.Offers hot potatoes stuffed with meat food meal integrated, and provides rice with green power.